The term eating for two really is not an accurate saying as you really only should increase your normal daily intake of food by about 200-300 calories. When you are pregnant you will feel hungrier than normal, this is your bodies why of making sure you eat enough for the both of you. However much more important than the quantity of food is the quality you eat. Maintain a healthy and balanced diet and avoid eating empty calories that are of no good for you or your baby. When pregnant make sure that you are eating enough protein and carbohydrates. An essential nutrient for your developing baby requires keeping up your protein supply and carbohydrates fuel your energy which you need plenty during pregnancy. Eat vitamin and mineral rich foods, in particular vitamin C and iron. There are some foods that are best avoided as they are of no benefit to you or your baby, some of these include sweeteners, soft drinks, artificial cream, savouries containing sugar, ice cream containing added sugar, sweets and chocolate, commercially produced biscuits and cakes, tinned fruit, etc. In addition to cutting out foods that are bad for us you should also cut down on your morning cup of coffee and afternoon cups of caffeinated tea. If you don’t want to give these up completely decaffeinated coffee and tea is available and still has all the taste and flavour of regular. Without going on about all the good foods that you should be eating it really is about using some common sense and willpower. We all know what is and isn’t good for us, do your best to stick to eating these foods that are good for both you and the baby. Just remind yourself that anything that you eat in excess now that is of no benefit to the baby is extra weight you will have to lose when your pregnancy is over. You can of course do some safe exercise during pregnancy (which we discuss in another article) to help maintain your weight however you should never “diet” while pregnant. Do remember that weight gain is a natural part of pregnancy; doctors generally recommend that women during pregnancy should not gain more than 10 to 12 kgs over the 40 weeks, 3 to 4 kgs of this is the baby and the remainder is the baby’s support system. The following is a guideline only, as long as you are eating well there is no need to spend your time measuring and counting portions. An example of your daily needs include calcium foods – 4 servings, first-class protein foods – 3 servings, fruit and vegetables (green leafy and yellow or red) – 3 to 4 servings, whole grains and complex carbohydrates – 4 to 5 servings, iron-rich foods – 2 servings and vitamin C foods – 2 servings. As well as food, be sure to keep up your fluids, drinking eight glasses a day preferably water. To help you stop from slipping into bad habits and eating unhealthy food, here are some tips that are great little shortcuts that don’t take too much effort. Cook a range of healthy meals ahead of time and freeze. Write the date on the container so you know when the meal was frozen. Keep a range of frozen vegetables in your freezer for those days when you may be short on fresh vegetables for meals. Research has shown that frozen vegetables are just as good as fresh. Try throwing in some extra frozen vegetables when making soup and casseroles to help increase your daily servings. Buy meat in bulk and freeze in meal size portions to always have food on hand to have a homemade meal. Keep meals simple, slow cookers are a great time saver and are a fantastic way to throw a large variety of vegetables into one dish. Likewise try stir frying vegetables, steaming or grilling for speed. 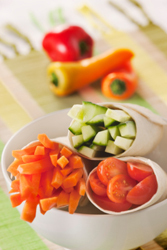 Even eating raw vegetables as snacks during the day are a great alternative to reaching for the cookie jar. Leaving food to bake and cook on its own means less time spent in the kitchen on your feet. Use a microwave to cook, it is very quick and retains nutrients. Big pots of homemade meals can provide you with several meals rather than just for the one dinner. Soups and casseroles again are a great example of one pot cooking to save time and effort. Fruit and vegetables are great snacks for when you need something to nibble on during the day. Cut some carrot and celery sticks, tomatoes and cherry tomatoes are tasty and easy to eat, there is nothing better than fresh beans, capsicum sticks or radishes as a quick snack. Dried fruit is also very handy, and you might even find mixed bags of a variety of dried fruit at your supermarket that include nuts and seeds for extra taste. Dairy such as cubed hard cheeses and live-culture yogurt are another fantastic option. Try adding some powdered skimmed milk for extra calcium in drinks. Wholemeal crackers, crispbreads and breadsticks are a fantastic option especially when you are feeling a little morning sick. Even a piece of wholemeal bread will give you a boost throughout the day. Also try adding wheatgerm to your salads, sandwiches, cooked and baked dishes for an easy vitamin and mineral kick. Most importantly carry a bottle of water with you everywhere you go, you will be surprised at how it can help you feel better and help when that sick feeling hits. 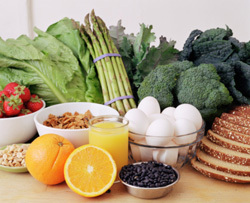 During the 8 weeks article the importance of folic acid is discussed and although you should be taking some sort of supplement for folic acid there are also plenty of folate-rich foods. Green leafy vegetables, cereals and breads are great for folate; in particular strawberries, oranges and avocados are a great source. For further information about folic acid see the Pregnancy Baby Child 8 Weeks Article.